21st century global education has been an endeavor running at a significant pace at DLPS. 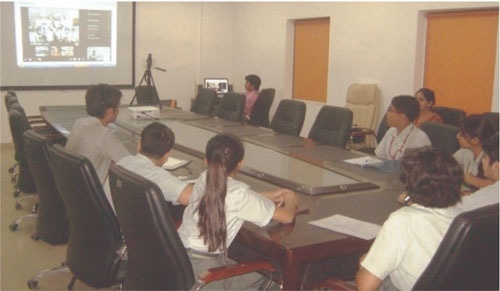 In this context, Video-conferencing sessions have become an indispensible tool which capacitates our students to exercise their communication skills without the confinement of distance and nationalities.In the new session, the school has organized multiple Video-Conferencing sessions with students from various countries such as Pakistan, Scotland, Lebanon, UK, New York and more, where children have learnt to respect each other’s views while retaining their own stand. These video-conferencing sessions have helped the school open vast doors of overseas interactions, helping children understand each other’s community, faiths, beliefs, lifestyles and have facilitated a joint discussion towards solving some commonly felt global concerns. Over 20 Delfites of classes XI and XII enthusiastically engaged in a Skype videoconferencing session with 8 Schools across India. Taking the student enterprise, ‘Money plant’ to a new level, Delfites are all set to develop contacts and build strong networking as an indispensable part of expanding a profitable table business. Leading schools like Suraj Bhan DAV, Vasant Vihar, Darbari Lal DAV Model School Pitampura, JKG International,Vijaya Nagar, Indraprastha World School,Paschim Vihar, St. Marks Janakpuri, Mount Abu Sec-5, Kulachi Hansraj and Sanskriti KMVtook part in the session. As a part of their discussion, the students deliberated upon the organisational structure, types of unique products manufactured across different schools, ways adopted to study consumer base and effective time management. The interaction proved to be an effective remedy to the challenges faced by different schools. 20 Delfites of Grade 7 participated in a multipoint Video Conference on Oct 4, 2018, exchanging their views on ‘Identity and Belonging’. The session that was moderated by Generation Global, – Tony Blair Faith Foundation saw over 60 students from Blue Sea School Qasimabad Hyderabad — Pakistan, G.D. Salwan Public School and Indraprastha World School from India. Students from each School shared their opinions about Identity from many perspectives. Students discussed how their identity is being affected by their self-esteem, culture and physical appearance. They also shared and explained the challenges they face with respect to their idetity.The questions were appropriately structured that led to a deeper dialogue. The session gave them an opportunity to embrace differences, by exploring their own attitudes in relation to equality and diversity.